Racing 92 fly-half Pat Lambie has retired from rugby because of “persistent post-concussion symptoms”. The South Africa international, 28, said he had contemplated retiring even before arriving at the French side. One key moment dates back to 2017 when he spent several months out of the game after a knock to the head in a collision with Ireland flanker CJ Stander. And some fans online are blaming the South Africa-born Ireland international for Lambie’s premature retirement. I won’t stop blaming @CJStander for ending ur career I dd forgive him though..players need to put other players health into consideration when playing…it’s a game not a war!! 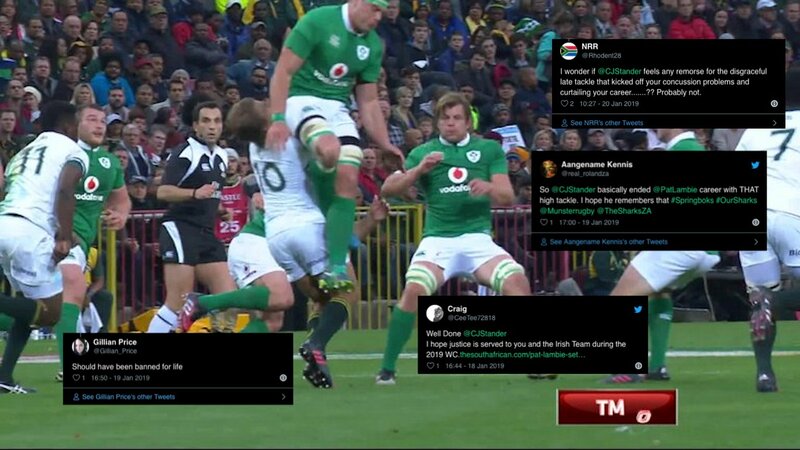 I wonder if @CJStander feels any remorse for the disgraceful late tackle that kicked off your concussion problems and curtailing your career…….?? Probably not. That attempted charge down by CJ did not warrant a yellow, let alone a red card. He was in the air as Lambie kicked,so he could not pull out of a perfectly legitimate attempt to charge down the clearance. It’s tough on a talented footballer when persistent injury causes early retirement, however, Stander is in no way to blame. That is total BS Brian o’Connor. He went into the challenge knowing full well he is an unstoppable wrecking ball, slamming into a player. He had every choice to avert the incident, he had no hope of even touching the ball. Reckless player decisions like that should be red carded.